Blackberries make good additions to the home garden. Several types of blackberries are available. Some types have a trailing growth habit, and some have an erect growth habit. Trailing blackberries have canes that are not self-supporting, so require a trellis system for support. 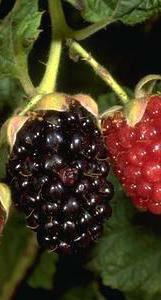 Erect blackberries have stiff, arching canes that are somewhat self-supporting, but could still benefit from a trellis. Blackberry plants live for many years. However, the canes grow one season (primocanes), produce fruit the second season (floricanes), and then die. Berries are borne on short lateral shoots produced on the floricanes. Both thorny and thornless types are available. The various blackberries are also referred to as caneberries, bushberries and dewberries. What are the sunlight and soil requirements for home garden blackberries? What are the planting and spacing requirements for blackberries? What kind of trellis system do blackberries require? How should blackberries be trained and pruned? How should blackberries be watered and fertilized?